We will be playtesting a very limited number of Wilson Rush Pro 3.0 shoes for a playtest. This playtest is open to both men and women in the USA only. IMPORTANT: The requirement for this playtest is that you must post a review in this thread by the deadline (check back). Application period is now closed. Playtesters will be selected by Thursday, February 21. If you are selected, you must reply to our confirmation email and confirm that you are able to perform this playtest. We select playtesters based on a number of factors, including past performance on playtests, user history, posting in topics similar to playtest, etc. If you do not post a review by the deadline or if your review is clearly lacking effort, you will be excluded from future playtests. How many hours did you play with the shoe? As always, we ask that this thread to be used only for questions, discussion and playtest reviews. Extraneous comments will be deleted. Looks to be well cushioned for a fairly light shoe with good breathability. I had issues with toe jamming with the previous rush pros. Hope wilson addressed this issue. I played my first match with the 3.0 and didn't experience that. I think it depends on the width of your foot. It's definitely more a medium width shoe than a wide shoe. Hmmm, not really sure about that. My feet are normal width, as in neither wide nor narrow. The toe jamming always happened when I ran for a drop shot and suddenly stopped or changed directions. I switched to the asics gel resolution 7 and I had no issues with toe jamming. However, I missed the traction of the rush pro 2.5. It gripped the court very well. The gel resolution 7 is a little slippery. I played a 2 hours and half match and it was the first time I wore the shoe. The only issue I had is a little blisters on the top of my left little toe finger/pinky toe (sorry for my English). But after a long match like that and the first try of the shoe I find it acceptable. I guess the shoe needs to open up a little bit but I conclude it's not a shoe for wide foot it's more medium or snug medium. The solution for you may be going for a 1/2 size up. Actually I'm a former Asics Gel Res 7's user and stopped to wear it cause it remains too tight and narrow, particularly in the forefoot area. Longer was good, I had enough space in front of my foot but the width was too tight. Otherwise I found the Gel Res 7 too stiff (outsole). I played with this shoe during 8 months approximately and found the comfort quite good, good cushioning, good padding inside the shoe but too stiff and too narrow. Otherwise it's a good shoe I agree. But contrary to you I didn't have sliding problem with the Gel Res 7, traction was good for me. Edit: I played with my old Gel Res 7 in a tournament match yesterday on hard court (porous asphalt, I don't know the exact term in English sorry) and finally had some slippery issues at the end of the match, when my legs were a bit tired. But my Gel Res 7 has 8 months of playing so maybe it's normal. I tried the 2.5s and had the toe jamming issue as well under similar conditions. No problem with GR7s. Other than the toe jamming issues, the Wilsons were very nice. Maybe the extra grip from the Wilsons caused the problem, as I had the same problem with Barricades which I felt had similar grip to the Wilsons. Excited to be playtesting the new Rush Pro 3.0. Hope Socal can stay dry for a few days. Look forward to your feedback. I too had some issues with toe jamming with the 2.5 and I'm hoping they addressed those with this one. Happy playtesting! Looks like a number of us had some toe jamming issues with the 2.5s. It was relatively minor for me, but I did have a few hard stops that weren't all that pleasant. I'll be sure to report how the new 3.0s fare in this regard. Otherwise I was a pretty big fan of the 2.5s, and the 3.0s look really promising. Used to Love Wilson Shoes.. but been using other brands in the last few years. These look great. Going to FL for 10 days.. hope these get to me so I can bring them down with me to really beat them up on the hot hard courts. My 1st shoe play test!! Excited !! Can anyone compare Rush Pros with the Kaos? I still have two new in box pairs Kaos "version 1.5" I got on clearance before they were discontinued, so not in a rush (sorry), just curious how the two types compare. I have used both the kaos and several pair of the rush pro 2.5's. The kaos for me was wider which I did not care for personally in and out of corners, preferred the 2.5's. The kaos appeal visually better for me. Performance wise it's probably going to come down to foot shape for you. I was hoping to be on this review but look forward to hearing the comments from others. Thanks, I was hoping the width would be about the same, since my feet fit perfectly in the Kaos, and I really like the stability. The breathable design of the rush pro made me want to try it, since the Kaos can get pretty hot, especially in my preferred black/red. I'll wait for the 3.0 reviews also. Toe jamming? That’s not good. When I was starting back to tennis after many years off, my big toe nail kept getting caught in my shoes and it really, really hurt. They’d get caught and pushed back in my shoes. I actually lost both big toe nails and I’m now very picky about my shoes. I cannot remember the shoes I was wearing but I feel inside with my hands to see if it’s a possibility. I’ve been selected to play test the new 3.0 and will give a thorough review. I’m very picky about the feel of my shoes since I’ve experienced plantar fasciitis and even went through plantar fascia release surgery last year. I also developed a neuroma so I’ve got that going for me too. Can you believe people describe me as fast? 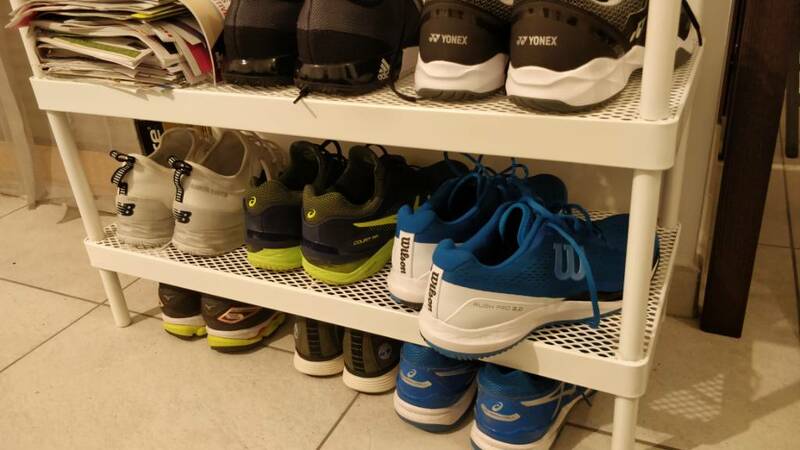 Can you confirm that the test shoes haven’t been shipped out to the playtesters yet? I was out of town for the past 4 days so just want to make sure it didn’t arrive while I was out and some chump is now enjoying a new pair of stylish kicks. As far as I know.. they have not shipped. I got a notice from UPS when anything ships to me. The email sent out to play testers said.. shipped in 1 to 2 weeks. I’ve got the same thing but wanted to make sure I hadn’t missed something. My wife and I work out of our home... we are always here..LOL. Any updates? Curious about these shoes.. I still have no notice from UPS. The timing is perfect for me as spring HS tennis practice begins outside (NE USA) for me today... Not playing.. coaching LOL. I will give these shoes a good test!! It's been about 3 weeks since TW said it would be 1 to 2 weeks until they ship, so running behind schedule. Wonder if having a good number of staff at Indian Wells is part of the reason. I'm sure this means the review due date will be pushed back a bit also. I'd be interested by your review once you'd receive the shoes. I personally already have the shoes (but I'm not a playtester as you). I just tried the shoes 3 times. 2 training sessions and 1 tournament match and found the Rush Pro 3.0 very comfortable particularly after the first try at home. But during match and training I'm just a bit disappointed about how perform the shoes particularly the responsiveness. I don't know exactly, but something bothered me, I didn't feel as dynamic as other shoes, maybe the cushioning is too soft and not enough responsive I don't know. That's why I'd be interested sharing with other people to know what they think about this shoe. I'd give a complete review after a much longer period. Just surprising the shoe is already on sale (in Tennis Warehouse US, cause I paid more in Tennis Warehouse Europe where it's not on sale). Sorry for the delay, with BNP and getting stock of these later than anticipated, they will be shipped out by the end of this week. The due date will be updated shortly. Thanks so much for the update.. Brittany !!! Sorry - the shoes will be shipping out Monday. The shoes have been shipped out today. Sorry for the delay. I have updated the due date. Just got my UPS Notice... thanks TW and Wilson!!! Just received the shoes. Will post some pictures later tonight. Love the design. I've had two Wilson Rush Pros - the 25th anniversary design & the glide and prefer the design of the 3.0. I had the original Glides and the Rush Pro 3.0s fit so much better! The Glides were very narrow in the mid foot area which made is hard for my hard orthotic to seat fully. The uppers were also quite hard and rigid. The new Rush Pro 3.0 are wider through the midfoot. The toebox is roomy. Lengthwise they run slightly longer so some people may want to try a half size smaller. They have a completely seamless upper and I could tell after dropping in my hard orthotic under the sock liner, putting them on and walking around the house that these are going to be super comfortable with no pinching or hotspots. The Glide just felt kind of cheap. The Rush Pro 3.0 feels like a high end top of the line shoe. The workmanship seems to be first rate. I love the execution so far! The new Rush Pro 3.0 are wider through the midfoot. They toebox is roomy. Lengthwise they run slightly longer so some people may want to try a half size smaller. They have a completely seamless upper and I could tell after dropping in my hard orthotic under the sock liner, putting them on and walking around the house that these are going to be super comfortable with no pinching or hotspots. So happy to hear your 1st impressions. Sounds like a great shoe for my game and feet.. Mine are not coming until Tues.. I live in the NE..
What shoes have you liked in the past? The Rush Pro 3.0 fit and feel better than the Nike Zoom Cage 3, babolat propulse 2, 3 and 4s. for me. They remind me a bit of the lunar ballistec 1.5s but faster feeling. not as chunky in the front. My previous experiences with Wilson shoes weren't anything outstanding - they weren't bad but nothing to really note. I wore through the 100 year anniversary design really quickly, and I stopped wearing the Glide because I almost broke my ankle playing in them. I liked how the Glide felt when I put them on, but playing in them was another story for me. I removed the plastic pieces on the outsole, so I mainly use the Glide to walk my dogs and stuff. My favorite shoes in the past few years have been the Asics Gel Resolution line. They are the most supportive for my feet and style of play. Also, they last me the longest. I also really liked the Babolat SFX3 because it was so light and comfortable. It does not have the support that the AGR has, but for light leisurely plays and rallies, especially during the summer months, they are more than enough. The weather hasn't been the greatest. I plan to put these shoes to the test this weekend. @mhkeuns I received the black/white colorway. I assumed everyone would be getting the same color shoe. @mhkeuns, were the 100 anniversary shoes Rush 2.0s? The outsoles of the 2.5s have good durability I thought, though not quite on par with Resolutions. The Glides I always thought were a ridiculous concept. If you know how to slide on hardcourts, you don't need the Glides. And if don't know how to slide on hard courts, well you probably need to avoid the Glides. I believe they were the 2.0. It was just ok. Nothing outstanding, except for the colors. I can definitely see he improvements on the 3.0. They look and feel so much better. The Glides... It grabbed when I wanted to slide and slid when I wanted firm footing. Surprised that more people haven’t hurt their ankles. That’s pretty cool. Maybe we can all post some pics of the different colors. Dang it, think I pocket-edited my post by mistake, hence the huge typo. Anywho, I remember reading on the forums that TW began playtesting the Glides, but stopped due to such issues. I believe Chris in particular had mentioned taking a spill when he wanted grip but instead got slip. The grip and slip was very unpredictable. In the pics of the 3.0's you can notice the material of the uppers seem to bubble up at forefoot. Is this an issue when you a wear them? No it's not. Cause the upper is very soft compared to other shoes such as the last solution speed (FF). No issue for me. Look forward to reading everyone's feedback. I dig the green/black w/ gum sole version that Ugo Humbert is rocking in Miami this week.